EnMS-Doc Assotiates together with our ISO 50001 Class EnMS partner EeSolution Engineering is pleased to introduce the newly establish Malaysia originated webpages. These pages of the site dedicated to Malaysia was created and is operated jointly by EnMS-Doc and EeSolution. The main purpose of operating the site is to generate awareness of the fact industrial energy users in Malaysia are willing to take advancing role to introduce ISO 50001 Class EnMS operation. This came after the successful implementation of 3-day ISO 50001 Class EnMS Workshop conducted in Kuala Lumpur 25-27 September where participants appreciating the essence and the superiority of the ISO 50001 Class EnMS operation. they moved to form a league of ISO 50001 Self-Declaration union in Malaysia to promote the EnMS activities in order for the industries in Malaysia to take competitive edge in the global scene. EeSolution Engineering together with EnMS-Doc Associates held 3-day workshop (Workshop logistic organiser: Hallmark Access, Malasia) to make the participating organisation to become competent to self-declare ISO 50001. The 3-day workshop session was designed to make the participants after the completion to be able to lead their organisations to run ISO 50001 Class EnMS operation. In order to achieve the task, the organiser expertise offered to form a partnership through the session to make participants competency as well as to provide ready to use EnMS key management documents including EnMS Charter. Additionally, MediaWiki based EnMS operating System, wiki50001 was introduced for smooth and efficient execution of EnMS operation. 8 credits for Energy Master Class Professional Scheme is awarded to each participant by Suruhanjaya Tanaga (Energy Commission) of Malaysia. After the successful outcome of the workshop, the particiants and the organiser had a serious discussion on how to capture the opportunity from the lessons learned from the workshop, and how to disseminate the superiority of ISO Class EnMS operation to promote the sustainability business development amongst the industries in Malaysia. The conclusion from the discussion was to initiate the formation of "Energy User League of ISO 50001 Self-Declaration Malaysia" (tentative Name) by workshop participating organisations taking the initiative. 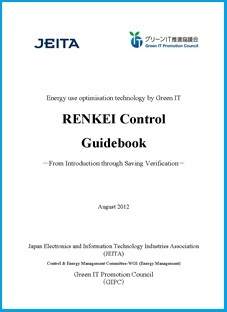 The guidebook is to provide useful information and examples of various applications related to the energy performance improvement technique called "RENKEI control", an optimisation concept to control two or more control elements for harmonisation of input(s) and output(s) to provide optimised solution for energy efficiency. The Japanese word "RENKEI" literally translated as "cooperation, coordination or harmonisation" which suggests that "RENKEI control" is to pursue energy efficiency optimisation with two or more elements interacting within one another to provide the most efficient and effective result for energy performance from the control. The RENKEI control concept is a consolidation of a long time energy efficiency experience and accumulated knowledge in Japan with a smart utilisation of “Green IT” concept. The RENKEI control concept was developed by the JEITA Control & Energy Management Committee WG1 (Energy Management working group) members compiling their intellect and know-how with immeasurable effort. The guidebook of the japanese version was published in January this year. The guidebook in English was produced under the METI Commissioned Project "Support for IT utilization aimed at fostering a knowledge economy in Asia (promoting Green IT)" by GIPC of JEITA, and completed in August. We also prepared "Introduction to RENKEI Control Concept" presentation as one of the new free download materials. Go to the newly established "page Malaysia"